Fighting infections relies on our immune system recognising microbes that cause disease, attacking the infection, and ‘remembering’ that infection if we encounter it again. This immune memory is crucial to giving us ongoing protection from disease, and is also key to vaccination. Dr Kim Jacobson, a researcher at the Monash Biomedicine Discovery Institute, is an expert in understanding how we form immunity to infections. 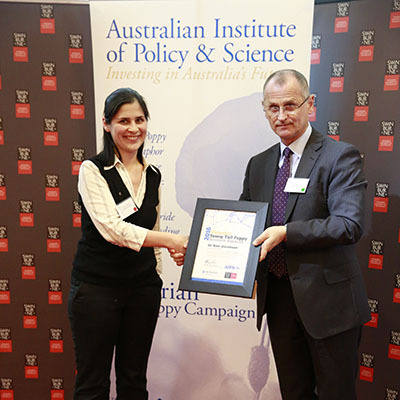 In recognition of her outstanding research and science communication to the wider community, Dr Jacobson was recently announced as a recipient of the 2016 Victorian Young Tall Poppy Science Award from the Australian Institute of Policy and Science. Dr Jacobson received the award for her research looking at the network of molecules that orchestrate the immune system’s ability to tailor its response to specific infections. Her research identified a key molecule that allows cells that produce antibodies – critical to immune memory – to survive. Dr Jacobson has also published articles for The Conversation, which were republished around the world and presented to state and federal politicians on issues facing women in science, technology, engineering, mathematics, and medicine (STEMM). Dr Jacobson said she was honoured to receive the award and excited to participate in science outreach programs open to award recipients. “The Young Tall Poppy Science Award is fantastic recognition of our research into how we form immunity and how this is subverted in disease, but also the importance of communicating that research to the public and politicians.” Dr Jacobson said. The Young Tall Poppy Science Award is presented to researchers with fewer than 10 years of postdoctoral experience, who combine world-class research with a passionate commitment to communicating science. Award winners spend a year sharing their knowledge with school students, teachers and the broader community through workshops, seminars and public lectures. Dr Jacobson is head of the B cell and Antibody Memory laboratory at the Monash Biomedicine Discovery Institute, and is a HMRC R.D. Wright Career Development Fellow.